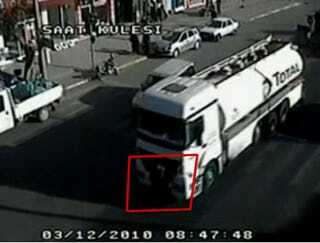 This 53-year-old man was crossing a street in eastern Turkey when he stepped in front of a cab-over fuel truck. His choices were to get crushed or run like Frogger. He choose run, and actually survived. It's now International Act Like Frogger Day, where the only way you win is to not act like Frogger.